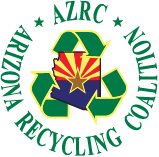 Attend the 2018 AzRC Annual Conference to learn more on The Changing Tides of Recycling. There will be 12 educational sessions to choose from, several awards, grants and scholarships handed out during lunch, which is provided and a great happy hour to finish up your networking before the day is done! Sign up today to learn about the latest and greatest of Arizona recycling. Thursday, October 18, 2018 from 9 a.m. to 5 p.m.